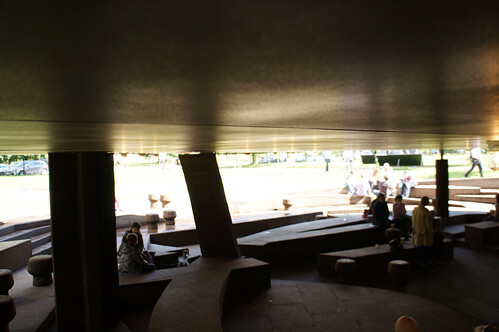 One of my favourite summer event in London is the Serpentine pavilion. In its 12th year, the surprisingly permanent-looking structures are erected in the spring and dismantled in the autumn. They are variously strange and awe-inspiring. This year's is a reference to the pavilions that have come before. An archaeological dig of sorts, the 12 pillars represent the past structures, while geometric cork blocks wrap around the remnants: leftover cables, plinths, foundation pieces. All is covered by a flat metal disk collecting rain water, making visible the ground water that normally remains underground. How appropriate in this deluge of a summer! 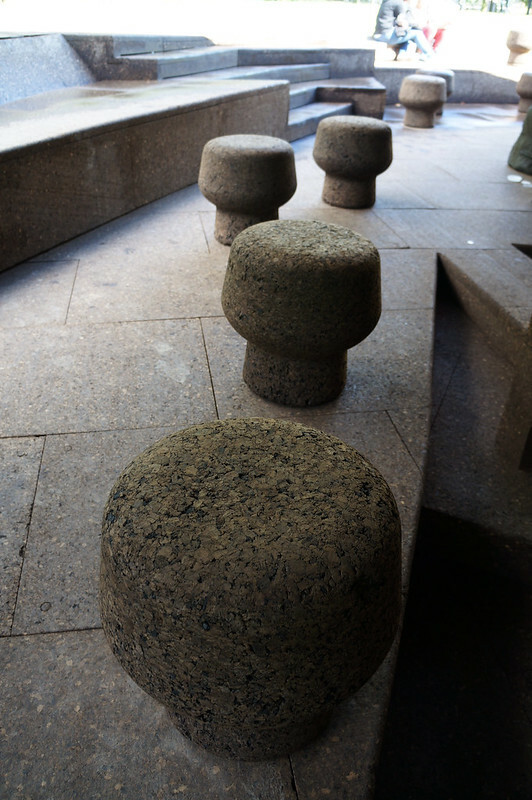 Best of all, stools shaped as champagne corks. A hint? At last- a day without rain. For weeks it seemed as if spending the summer in London was a really bad idea for someone who eshews socks and umbrellas. I am not a fan of weather in general, preferring the bland simplicity of Dubai's perma-sunshine to the chopping and changing of London days, where rain is followed by blinding sun by lowering grey clouds by howling winds. It's July, and finally I am confident that I can go out and not catch a cold. A perfect day to take a Boris bike for a spin. 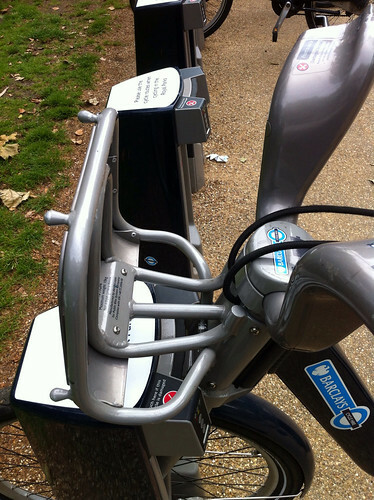 What is a Boris bike? 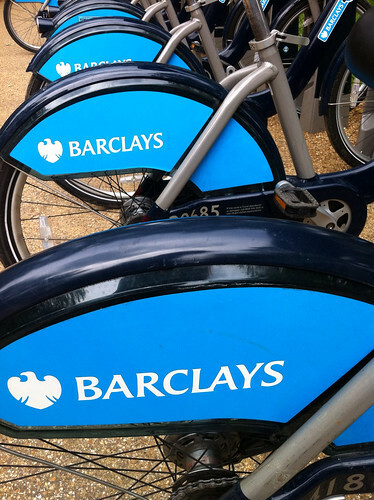 Barclay's Bikes, as they are properly called, are clunky upright bikes, built like tanks (23 kg, chain and mud guards, puncture-proof tyres, built-in dynamo, brakes and gears courtesy of Shimano) and liberally labelled with the blue and white logos of Barclay's sponsorship. 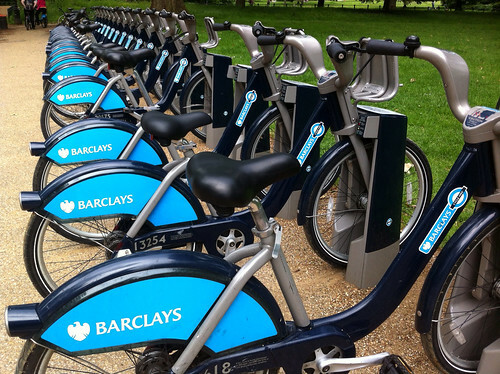 Boris bikes are named after the London mayor who introduced them in 2010. They are niftily designed to withstand daily punishment by tourists as well as commuters and casual users, with hiring prices cleverly planned to encourage short trips over day-long tours. As an addition to the tube/train/bus network of central London it is to the designer's credit that they are so popular that on a sunny day they are impossible to come by. So how do you use one of these chunky bikes? Where do you pick one up? How do you pay for the ride? As with many activities lately, it all starts with an app. Barclays themselves have designed a very functional iPhone and Android app that looks for docking stations in the vicinity, tells me how many bikes and spaces are available, even lets me plan a ride. At a docking station I can pay for a bike, check the map and dock my bike when I'm finished with my trip. I am an annual member for £45 per year, so I have a key to quickly free a bike. Before I joined the scheme, I slipped a debit or credit card into the payment point to print out a 5 digit keycode to use on the bike rack's keypad. Having a key has made grabbing a bike so much faster, rather than having to click through the multiple choice screens, accepting terms and conditions, choosing the number of bikes, and receiving the I can be on the bike in seconds. The iPhone app lets me plan my trip. I can choose from speedy, steady or quiet route types, and Google map will show me the way. A nifty built-in timer will tell me when my free 30 minutes are up. It would be nice to have turn-by-turn speech instructions, so that I wouldn't have to stop at junctions to check the map or try to memorise the route, and a phone holder in the handlebar would also stop me from getting lost, but built-in GPS units on each bike may be too much to ask for. The bike, for all it's clunkiness, can be adjusted to fit. I set the bike to my preferred height by the numbers on the saddle stalk. There is a holder for a bag welded to the handlebars. No back wheel rack means I can't carry heavy shopping or multiple bags, so I have started to travel light - and avoid wearing trailing scarves or bulky jackets lest I garrotte myself in transit. I check the brakes, pedals and bell and off I go. I am ready to join London's crazy traffic. Londoners are more competitive than most other city dwellers I have encountered. While in other countries road traffic can be a free-for-all, a mess of different driving styles like Dubai, hindered by a complete lack of signage like Addis Ababa or just a general flouting of the rules like Nairobi, London has an air of repressed anger funneled into intense competition between the different classes of travellers. Everyone uses and abuses the rules to their own benefit: taxis dash down bus lanes, cyclists run red lights to get the jump on motorised transport, buses squeeze their huge bulks into gaps in the traffic flow. Pedestrians are hyper-alert to any movement around them, as neither the cyclists nor the motorised faction take any prisoners. None of the dreamy jaywalkers of Joburg CBD, if you are walking in London you better have your wits about you. Throwing a group of amateur cyclists into the mix has interesting results, specially since - unlike other first world cities - London has barely any dedicated bike lanes. Marking yourself out as a Boris biker means labelling yourself ignorant of the unwritten rules of London traffic: every second counts and there is always someone who is willing to overtake you. Don't hope for mercy, because getting there fast is serious business. Boris bikers often dawdle, they may be lost, or vague as to their direction, they are inexperienced cyclists. Their bikes are heavy and unwieldy, so they are slow to react. And the stigma of the Boris biker can not be hidden, it is a blue flag of shame. One thing I have learnt from the Boris bike scheme is that Londoners are desperate for a new, easier way to get around town. Taxis are expensive, buses slow and the Tube crowded and hot. Commuting by bike is not an option for most Londoners, the distance from their home to the office is just too great and traffic on the main trunk roads into town too dangerous. But for getting round the city you can't beat the bike. I would be reluctant to lock up my bike in public in London, lest it is stolen or removed, but the Boris bikes are designed to be placed in racks rather than used all day. The first thirty minutes of each trip are free, with prices rising steeply for longer journeys, thus discouraging bike hogging. No daytrips along the canal with this scheme, or leaving the bike outside while dashing into a shop, but definitely a quick dash from Oxford Street to Hyde Park for lunch. For casual travellers, or non-Londoners who just want to go for a spin, the system is perfect. 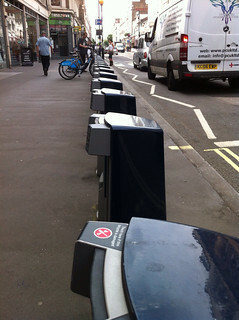 The bike scheme was intoduced in July 2010. To begin with the fully automated system of hiring and replacing bikes was flaky. The scheme is run by Transport for London, who control all local public transport aspects. But the actual operation of the scheme is outsourced to a private company, and the setup costs heavily sponsored by Barclays. The various layers of management initially resulted in an unreliable process, with people complaining of not being able to hire bikes and being charged random amounts if they did manage to get one. Two years later, and running 8.300 bikes and 15.000 docking stations with a recent expansion eastwards, most complaints relate to the incredible success of the scheme, which regularly results in bikes being unavailable, specially in the West End where pressure comes from Hyde Park tourers and West End party people heading out of Zone 1. The logistics of the scheme are dazzling: broken bikes need to be identified and fixed (bikes get an inspection on average every two weeks, and numbers of destroyed or stolen bikes barely reach double-digits after two years); bikes need to be relocated to busy areas when a wave of customers have left them stranded in the wrong part of town (the company uses electric vehicles for this so as not to negate the carbon savings from all the cycling); vast numbers of payments have to be processed properly with custom hardware (keys, docking stations) and unreliable humans in the mix. London's bike scheme is not the first in the world. Many other cities have offered impromptu hire bikes to their population, from Amsterdam to Montreal, many with much superior biking infrastructure, prioritising human-powered traffic over cars. Such is the pressure on transport options in London that any new choice was going to be taken up enthusiastically, by commuters as well as casual users and visitors. The London scheme is simple and effective, now it just needs to bring about a shift in priority towards cycling versus driving. London has shown that this can be done with the success of the congestion charge, gently but firmly forcing car traffic out of the centre of London. If the next step is to pedestrianise the city and focus on good bike routes, London could amost become pleasant to navigate. I am certainly a fan, alreay regretting that I brought my own bike to London with me.